Hey all- can you believe it's October?! I seriously cannot. It's one of my most favourite months, right after December. I may love summer, but there's just something about October that makes me all kinds of happy. Maybe it's the mini Snickers, maybe it's not. It's thanksgiving this weekend here in Canada- it's the train leaving the holiday station and I'm not mad about it. 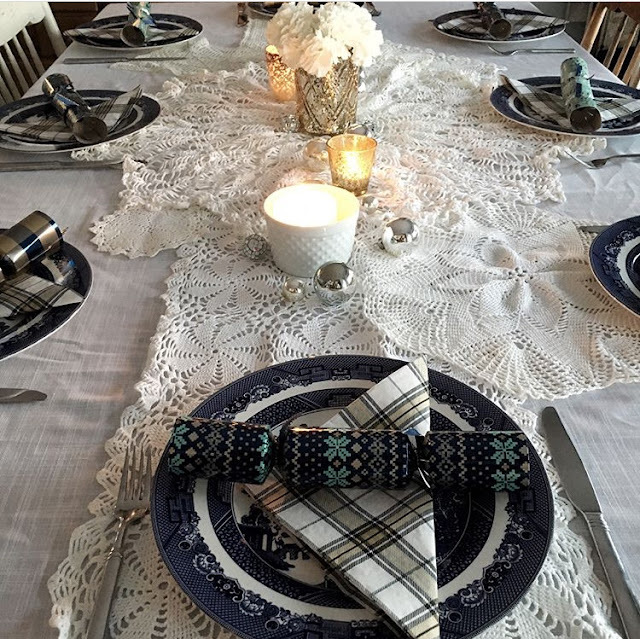 I'm not making thanksgiving dinner here this year- but I thought I'd share a little table inspiration and a recipe that is a MacDonald family tradition. It is not thanksgiving (or Christmas) if my mom doesn't have this on the table. 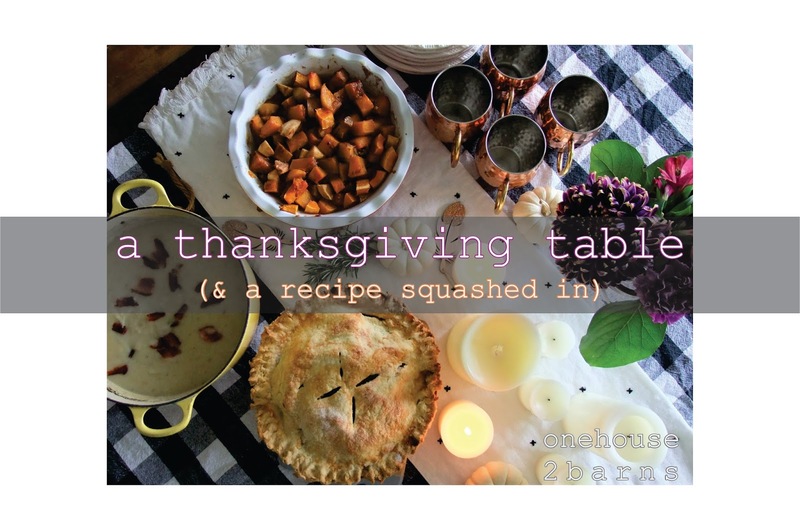 Ok, this isn't a really traditional thanksgiving table- there's not any orange or turkeys (there will be pie though, just wait) but I wanted to use what I had to show you that you don't have to buy a bunch of new stuff to have a fall feeling table. My dishes are Blue Willow- not plain white. I had white ones in the past (this could possibly be my, ahem, third or fourth try at dishes) and I just didn't love them. They were fine, but just not me. I used these Blue Willow at Christmas last year- you might remember that table here. To me, blue is a neutral too- it works with everything. And this time it's working with black and white and pops of purple. Down the centre of the table, I ran a combination of real and battery powered candles, some baby boo pumpkins and tiny bottles with clippings of mums and rosemary from my yard. To mark these cuties spots, I grabbed my Scrabble letters (look for bags of extra tiles at the thrift store, they're a fun little thing to use in your decor) In the effort to have less garbage (but more laundry, so I don't know if it makes a real difference) I have cloth napkins and I tied the napkins with a wooden feather that I picked up at the dollar store and dip glittered at home. 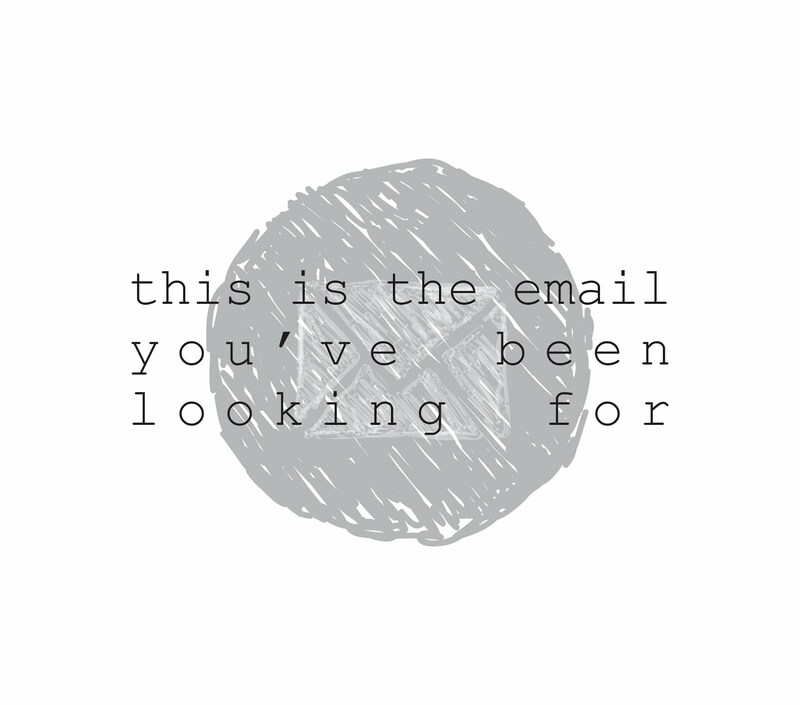 Now take a look at some of these little details- they make me happy. My fuji mum is in a cut glass (or crystal, I don't know) ice bucket I thrifted as well. So now we have a set table, let's get some food on it. I baked a pie JUST for this blog post. My family is very thankful for my dedication to all of you. My mom's squash and apple bake is a family tradition. I love it- I really love it with turkey gravy on it, and that's weird cause I am usually against the mixing of the foods. Hopefully you didn't just throw up in your mouth- cause this squash is really good. It's sweet, but not too sweet and makes a nice foil to the other vegetables and proteins you are serving. We don't have sweet potato casserole, or sweet potatoes at all, this is our substitute. It's super easy and you can assemble it ahead of time and throw it in the oven about an hour and a half before you're ready to eat. You'll need one butternut squash, two apples (I used three because they were pretty small) melted butter, I was feeling fancy, so I browned it, oh la la, brown sugar, cinnamon and some flour. I realize last time I made a recipe I was also wearing a black and white striped shirt. 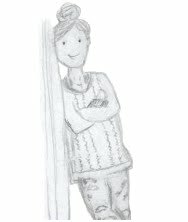 It is not the same shirt, but it gives you insight into my wardrobe. Drizzle that butter over top and coat up all those pieces. She's a beaut. Like this could almost be in the LCBO magazine it looks so yummy. And, spoiler, I ate it and it was yummy. 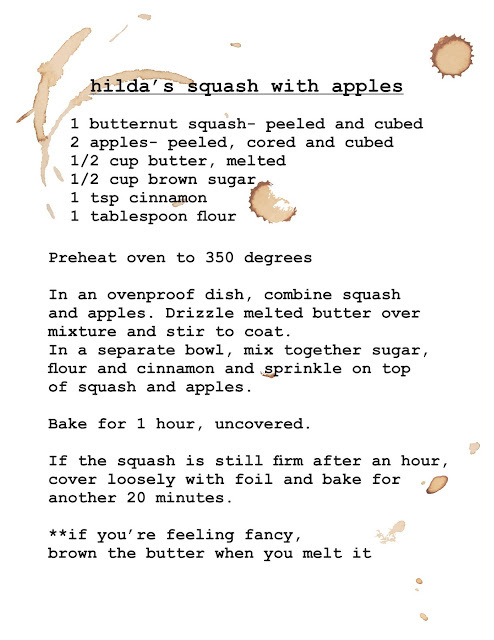 Here's the recipe for you, it's super simple and if you're a squash fan like I am, you'll love it. Happy thanksgiving Canadian buddies, and have a great week all other peeps! 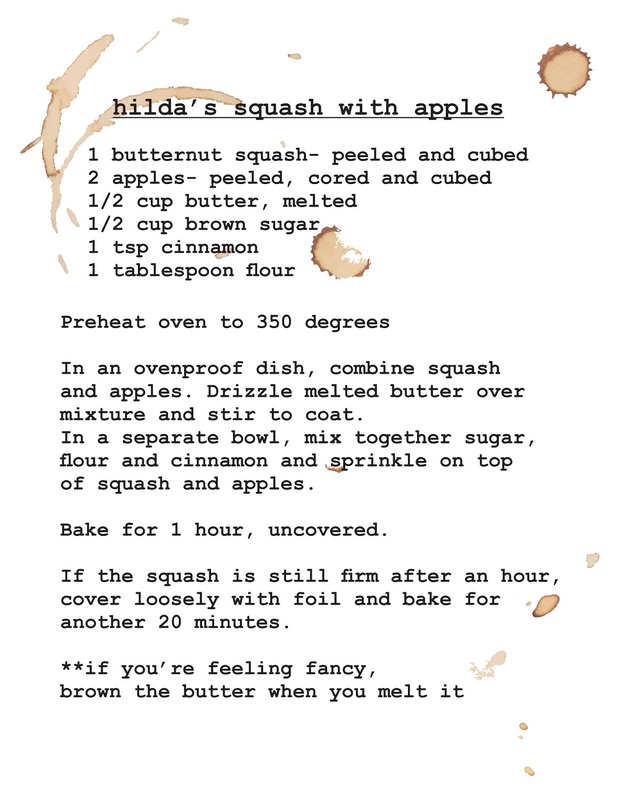 In an ovenproof dish, combine squash, and apples. Drizzle melted butter over mixture and stir to coat. In a separate bowl, mix together sugar, flour and cinnamon and sprinkle on top. Bake for 1 hour, uncovered. If squash is still to firm, cover loosely with foil and bake for 20 minutes more.